The fear of losing our teeth is something many of us experience. Today however, tooth loss does not have to be a permanent problem. Our dental implant system provides a safe and reliable method for replacing teeth, whether you have lost one, several or all of them. Your new teeth look and feel natural, and allow you to live, laugh and enjoy life with total confidence. 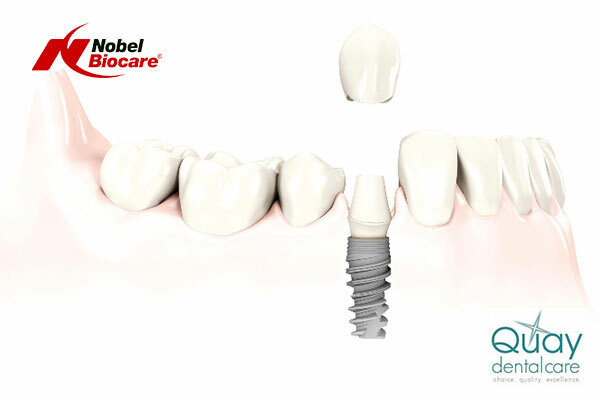 Press the play button below to view a Nobel Biocare video of a the placement and restoration of a single dental implant. At Quay Dental, Dental implants are usually the best solution for permanently replacing one or more teeth as they are designed to completely replace your old tooth – at both a root and crown level. The root of a dental implant called an abutment, and is made of a biocompatible metal known as ‘titanium’ – which is very strong and is accepted by your body like no other metal. Looking for a local Dental Implant Dentist?